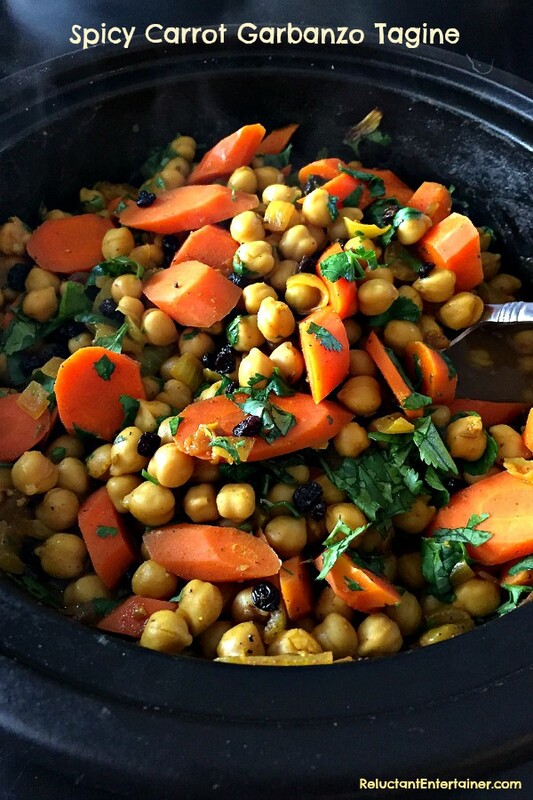 Today I’m offering a beautiful $200 Le Creuset Moroccan Tagine, a traditional cooking vessel from the Mediterranean and Atlantic coasts of North Africa, and a delicious Spicy Carrot Garbanzo Tagine recipe. This post is sponsored by Le Creuset. Recently Le Creuset launched a new Cuisines of the World Collection, that allows cooks to experiment at home with new flavors and cooking styles from Indian, China, Spain and Morocco. There are four pieces available in both Cast Iron cookware and oven-to-table Stoneware, and each piece can go straight from the stovetop or oven to the table. After returning from Africa and Turkey this past summer, my world and palate were opened to other cultures and delicious foods, like our first night in Turkey, where we ate an amazing, heavily seasoned lamb tagine. It was brought to our table, with the deepest and most intense flavors steaming in a tagine, and we savored every bite over a bed of rice. I’m excited that ONE reader today is eligble to win one of these beautiful pieces! I chose the green (palm), with a beautiful glazed stoneware “coolie” style lid, that sits on a cast iron base, ideal for use on any heat source, or as a baking /roasting dish in the oven. The cone-style lid allows steam to re–condense into water droplets on the cooler walls, and drizzle back into the ingredients, making them succulent and tender. 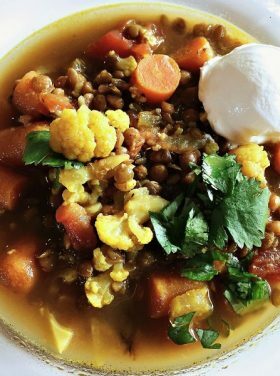 You cook with small amounts of liquid, on the lowest cooking settings (simmer), and the heat retention keeps food warmer longer. I started off by browning vegetables in the cast iron base with flavorful spices. I then added the garbanzo beans, lemon, currants and cilantro, and turned the temperature down to low, to simmer, with a tiny bit of water. ** Contest has ended. Congrats to Lynda (Me and My Pink Mixer) who won! 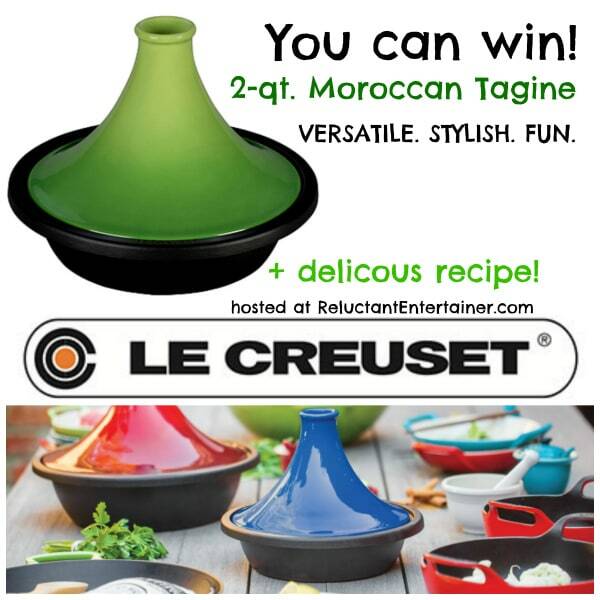 What to WIN: (1) Moroccan Le Creuset Cast Iron Tagine (2 qt. value $200) – you choose your favorite color! Thinking about the Cuisines of the World, what style of cooking attracts you the most — Indian, Chinese, Spanish or Moroccan? Click the rafflecopter to enter. 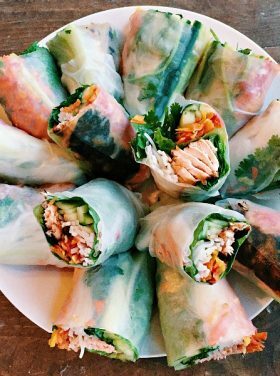 This is one of my favorite recipes; it has everything I like best in a recipe: inexpensive, quick, colorful, healthy, and delicious. It’s made from things I can keep in our pantry, so I can put it together anytime I need. The spices should be available in most spice sections, and you can decide how spicy you really want this dish. Some of my spices were from Africa and Dubai that my friend Laurel brought back from her trip, so are a little more potent than most of us can handle. I’m in love with this new side (or main) dish–so easy to make. Love the versiatility of serving it in a bowl for company! 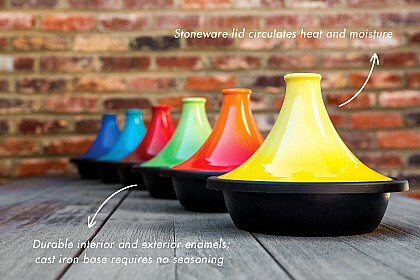 Heat oil in a tagine (or a large sauté pan). Add the onion and garlic, and saute until soft. 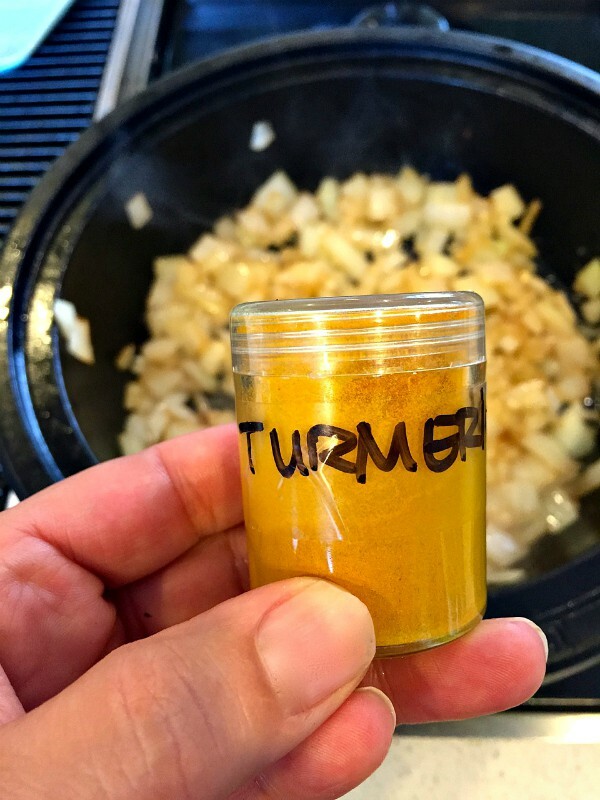 When the onion is soft, add the turmeric, cumin, cinnamon, cayenne, pepper, honey, and carrots. Pour in enough water to cover the base of the tagine (about 1/2 inch) and cover with a lid. Cook gently for 10-16 minutes. Add in the drained garbanzo beans, add more water to the base if needed, cover with the lid and cook on low (simmer) another 5-10 minutes. Season with salt; add cilantro, and serve with lemon wedges. 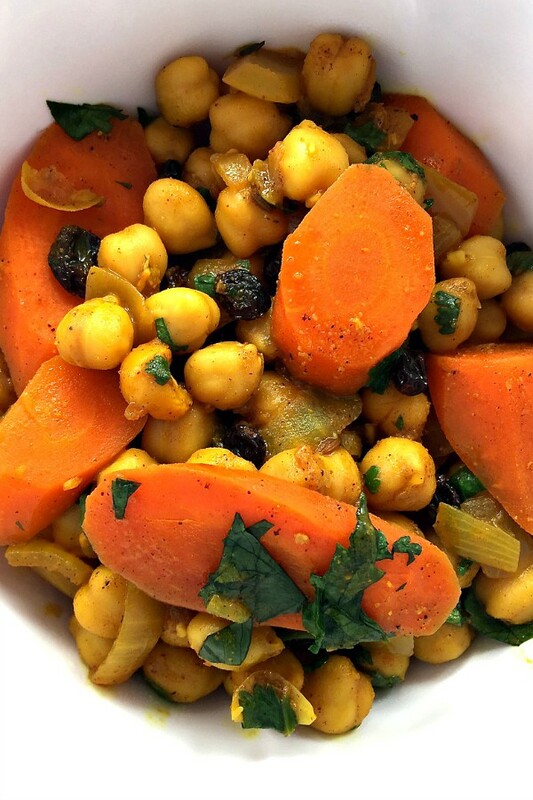 Ways to enjoy this Spicy Carrot Garbanzo Tagine: As a sandwich or wrap filling, in a rice bowl, as a side dish, or in pita pockets with a bit of plain yogurt as a sauce! 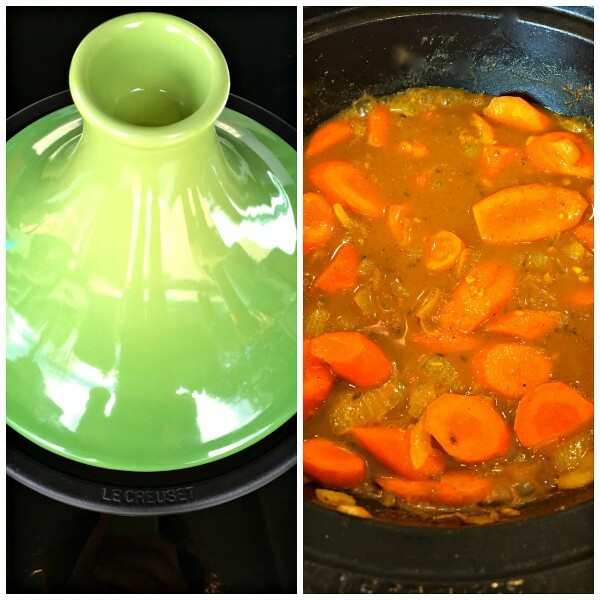 Le Creuset provided me with a $200 Moroccan Tagine, and one for the winner. As always, all opinions are my own! I love Japanese food, Thank you for the opportunity to win! My personal favorite might be Indian, but our family loves variety and we enjoy foods from around the world equally. We don’t have a tagine (yet! ), but we’ll improvise and try your recipe very soon! I love new experiences–I just recently tried Sichuan food and it was amazing! Would love to try my hand at Moroccan! 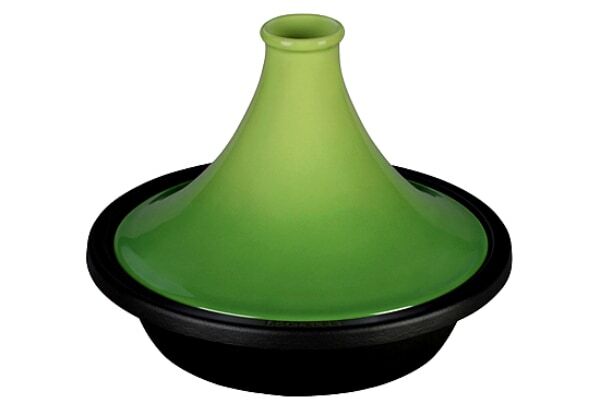 Most definitely Moroccan….what a beautiful cooking vessel !!! Indian by far. I ordered delivery from our local fave restaurant so frequently during our kitchen renovation that they don’t just know my name, they know my voice when they pick up the phone! I love Chinese cuisine but we cook mostly indian/pakistani and Thai cuisine at home. 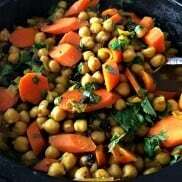 Moroccan attracts me the most because it’s the cuisine I haven’t explored yet. 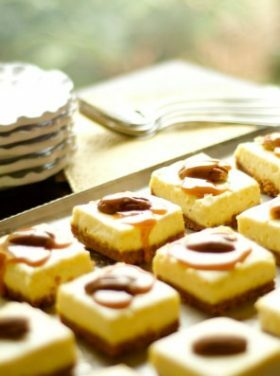 I would love to be able to experience the flavors and try to create a recipe from half-way around the world. Indian for sure, my husband is British. If I had to pick out of all of them I would say Spanish. My hubby just loves spicy and different tasting foods and dishes. I enjoy a lot of Spanish dishes and I love Italian also.